Up on the website are new photos of the recently finished housing in Bowflatts, Cumbria. Introducing an improved standard of housing to an area suffering from access problems and limited housing mix, the new accommodation provides 8no. two / three person bungalows and two storey housing as the first of a two phase construction project. Built upon a severe sloping site, these units have been designed to have level access to the primary entrance and have been positioned to create external private areas for each dwelling. 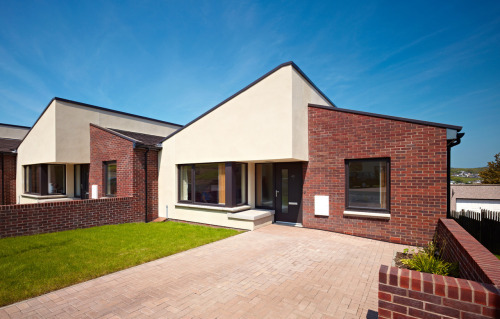 The bungalows have been designed for less mobile elderly or wheelchair users, rooms are spacious to allow for less mobile tenants and wheelchair turning circles. Future provision for a hoist between the master bed and bathroom and a second bedroom, possibly for a carer / nurse or overnight guests. All homes will have level access to front entrances, the bungalows also have large canopies and an external bench. The building was imagined as two mono-pitched blocks, the larger of which is to have a rendered finish and the smaller to be clad in facing brick. These blocks step both in plan and elevation to create a distinctive aesthetic for the new development. The bungalows share a communal garden with drying areas for each house. This is accessed from a pathway to the west of the terrace. The family house is designed with the main living space and second bedroom on the ground floor with level access from the street. The kitchen, master bed and family bathroom are upstairs with level access to the garden. This layout would allow for the possible future conversion of the first floor into an enhanced apartment with level access off the main road through the garden. Allows for change in people’s circumstances. 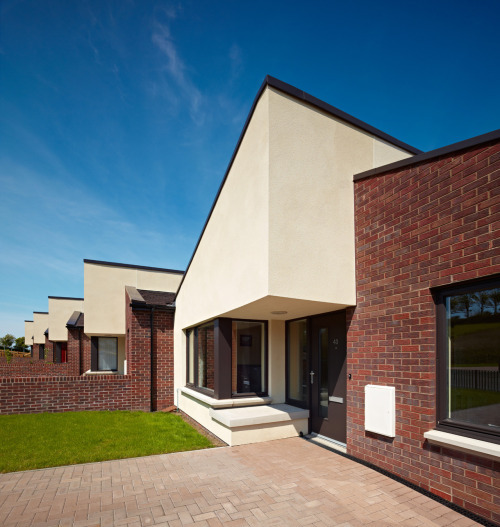 Each house has large corner windows on the large render finished block, these will allow morning light to enter the master bedroom and living room as well as affording the residents views over the street and onto the hills beyond.